Along with a purse for myself, I sewed a zippered pouch and a belt last weekend. Apparently I had belts on the brain after seeing Megan's candy wrapper version at Craft Social. Check those out here. You have read this article fabric / sewing / tutorials with the title May 2009. 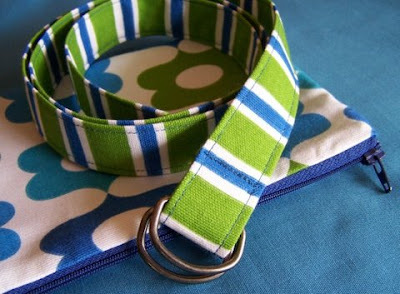 You can bookmark this page URL http://jenkrebs.blogspot.com/2009/05/weekend-sewing.html. Thanks! I'm traveling this week, so blog posts will be sporatic. At the moment I'm in Minnesota visiting the fam. Check out the vintage button stash my mom came across. 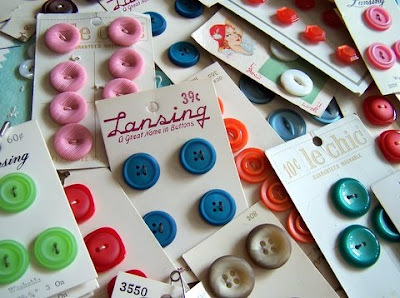 Lots of buttons for new bags. And for anyone wondering, Craft Social was a huge success. I'll give you a recap soon, with pix. You have read this article with the title May 2009. You can bookmark this page URL http://jenkrebs.blogspot.com/2009/05/away-for-bit.html. Thanks! While scrambling to finish-last minute details for tomorrow's crafty party, a terrible iced coffee craving overtook me. So I had to know: Is it iced coffee weather? I'm in luck. P.S. Awesome clipboard by Greenroom Eco, available at Target. You have read this article time-wasters with the title May 2009. 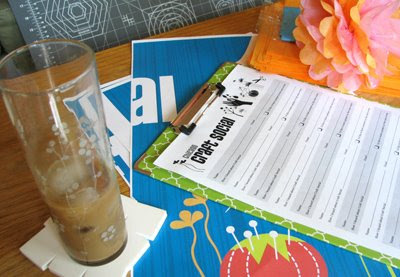 You can bookmark this page URL http://jenkrebs.blogspot.com/2009/05/iced-coffee-check.html. Thanks! Need a free font that looks handmade? Try Starry Stitch, Xstitch, Knitfont, or Home Sweet Home. You have read this article downloads / fonts / graphic design with the title May 2009. 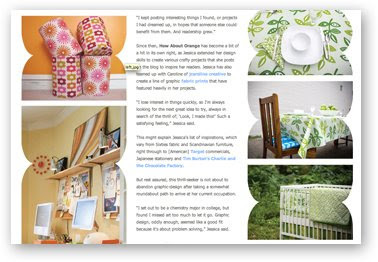 You can bookmark this page URL http://jenkrebs.blogspot.com/2009/05/free-stitched-fonts.html. Thanks! I'm enjoying this site called Share Some Candy. It's a "curated collective of inspiring design finds and art." Pretty cool. And for any designers thinking about starting your own firm, the funny Name My Design Company Machine will help you out. It's inspired by the zillions of design studios who have named themselves after colored animals. Seriously. Just start Googling a color plus an animal plus "design." Red dog. Blue cow. Purple elephant. Try it. You have read this article art / graphic design / random / time-wasters with the title May 2009. 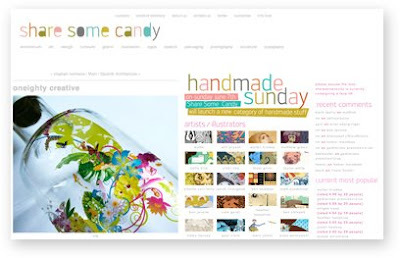 You can bookmark this page URL http://jenkrebs.blogspot.com/2009/05/design-candy.html. Thanks! 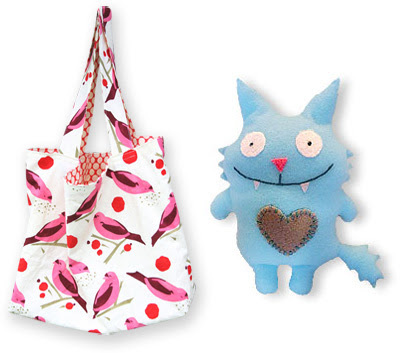 Thank you, peoples of the internet, for supplying instructions for these fun sewing projects. You have read this article fabric / felt / sewing / tutorials with the title May 2009. You can bookmark this page URL http://jenkrebs.blogspot.com/2009/05/some-little-sewing-projects.html. Thanks! Speaking of kittehs, a totally random tangent. 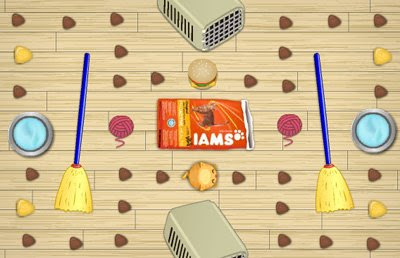 I couldn't stop playing this NomNomNom4Fud game the other night. Brought to you by the folks at I Can Has Cheezburger, you pull a kitten's tail to launch him at food kibbles, and he bounces off stuff like a pinball. Argh, what's wrong with me? If you're new to the world of LOLcats, here are some LOLspeak guidelines to get you started. You have read this article games / time-wasters with the title May 2009. You can bookmark this page URL http://jenkrebs.blogspot.com/2009/05/friday-time-waster.html. Thanks! You have read this article downloads / fonts / graphic design with the title May 2009. You can bookmark this page URL http://jenkrebs.blogspot.com/2009/05/infatuated.html. Thanks! Good news, handbag addicts! Buttercup bags in my fabric are now available for purchase in my Etsy shop, with permission from Rae Hoekstra, the genius behind this lovely purse pattern. But I kind of don't want you to buy any of these so I can hoard them all for myself. They're yummy. Update: All gone! You snatched all of these up in less than 24 hours, so none for me. Boo. But more are in the works. You have read this article shop with the title May 2009. You can bookmark this page URL http://jenkrebs.blogspot.com/2009/05/new-in-shop.html. Thanks! Hi, everyone. Today I'd like to give you a tour of my state-of-the-art outdoor studio. Exit through our back door, step out onto the stair landing, and look down. There it is, with some work in progress. The prime location of the studio between two urban residential buildings means it draws a lot foot traffic from pedestrians headed to the laundry room, basement storage areas, and dumpsters in the back. Dogs on leashes gallop over to sniff things, and children on tricycles stop and stare. Not ideal. But if I don't need the studio one day, I'm going to open a Dunkin Donuts in this location and get rich. 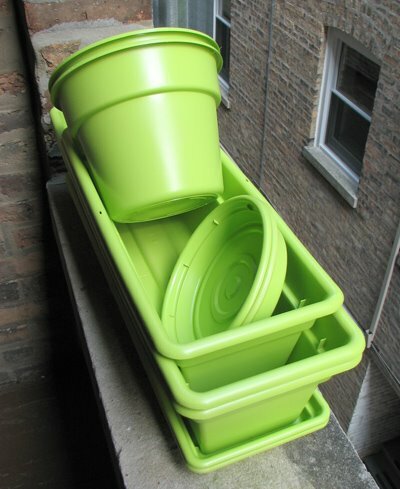 The latest studio project was spray painting these plastic planters. They used to be fake terra cotta color. No fun. 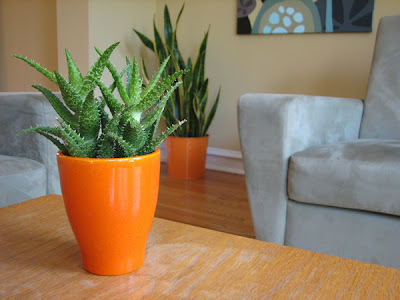 Hey, manufacturers, news flash: if planters aren't made out of clay, you don't have to make them clay-colored. Lime green is much better, we thought. 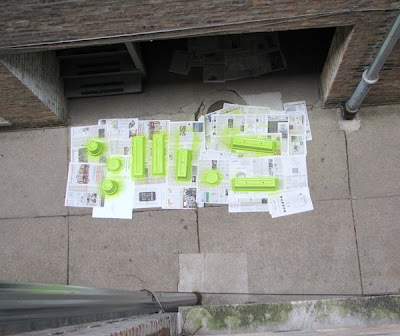 We applied white spray primer for plastic, then painted with Rustoleum Ultra-Cover Gloss in Key Lime. Now, to plant some flowers and herbs using my state-of-the-art greenhouse facility. You have read this article home with the title May 2009. You can bookmark this page URL http://jenkrebs.blogspot.com/2009/05/studio-tour.html. Thanks! Several months ago I was interviewed by Living Creatively, an Australian online magazine dedicated to arty, crafty, handmade goodness, and the business of making things. It's very lovely. The article has just been posted in the current issue. Thank you, LC! You have read this article press with the title May 2009. You can bookmark this page URL http://jenkrebs.blogspot.com/2009/05/interview.html. Thanks! You have read this article favorite things with the title May 2009. You can bookmark this page URL http://jenkrebs.blogspot.com/2009/05/say-hello-to-my-little-orange-friend.html. Thanks! You have read this article art / favorite things with the title May 2009. You can bookmark this page URL http://jenkrebs.blogspot.com/2009/05/a-charming-tilt-shift-video.html. Thanks! 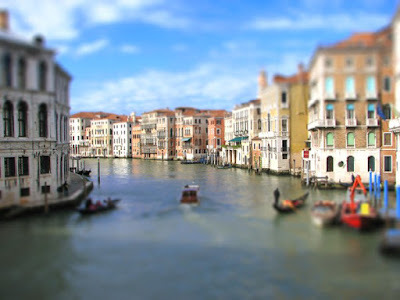 Tilt-shift style photos are photographs of real life scenes that are made to look like miniature scale models. And Tilt-shift Maker is a website that will fake it for you: upload your digital photo and it's manipulated to look like a miniature model. Fun! Some pictures work better than others, so read the tips. I tried it with this photo I took in Venice. Above is the miniaturized version. Do those look like teeny buildings and model boats? (Click to view larger.) Below is the original. Check out their photo gallery of samples. Interesting. You have read this article resources with the title May 2009. You can bookmark this page URL http://jenkrebs.blogspot.com/2009/05/tilt-shift-miniature-photo-maker.html. Thanks! Do you guys know about WhatTheFont? It's a site that helps identify a typeface from a sample you submit. I've had hit or miss luck with it, but it's always worth a shot. As a test, I submitted my blog header because I outlined the type in "How about orange…" so long ago that I can't remember what font I used. WhatTheFont suggested it's a typeface I don't even have, so that's obviously not it. If all else fails, you can submit your sample to their forum and an enthusiastic type geek will probably identify it for you. WhatTheFont also comes as an iPhone app. You have read this article fonts / resources with the title May 2009. You can bookmark this page URL http://jenkrebs.blogspot.com/2009/05/what-font-is-that.html. Thanks! Chicago area ladies, you're all invited to an evening of snacking, chatting, and making stuff! Even if you only feel about 2% crafty, that's okay, because we'll have a variety of projects you could choose from and people to help you. Or bring along that thing you've been procrastinating on and finish it in the company of other creative people. Motivation by osmosis. I'm helping to plan this Craft Social with a few friends, and we are terribly excited about meeting you all! To get the details and RSVP, visit the Craft Social site. You have read this article events with the title May 2009. You can bookmark this page URL http://jenkrebs.blogspot.com/2009/05/make-stuff-with-people.html. Thanks! 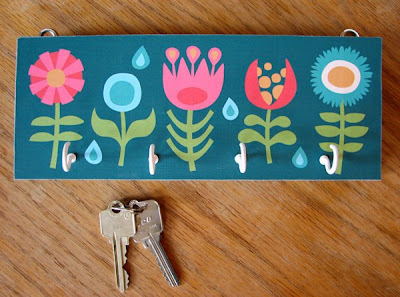 Here's what I did with that folksy flower design I made: a key rack. And hey, if you're going to drag out all the stuff to make one, why not make a few, I thought to myself. This is probably going inside our coat closet where the lighting is bad, so excuse me for not photographing it in action. Follow along if you want to make one. 1. I picked out a smooth, 4" wide pine board at Home Depot, and Alex cut it into 9" lengths for me. My job was to hold it steady, and I'm pleased to report I still have all my fingers. Sand the wood corners a bit to make them smooth. 2. 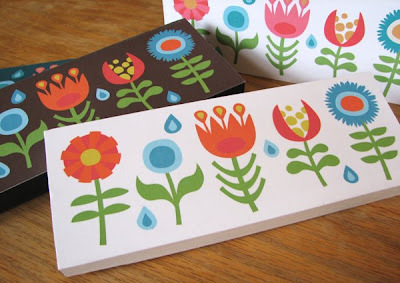 Find some decorative paper you want to use on the front, or get a color laser print like I did. 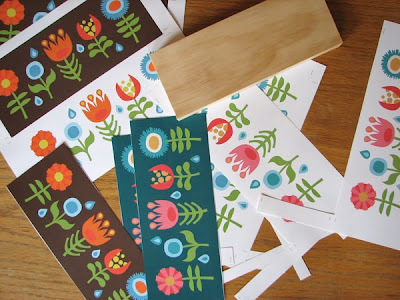 Trim your paper so it's 1/4" larger than your wood piece. 3. Paint the sides of your board a coordinating color. I did the back, too, so it would look more finished. I used acrylic paint. 4. Brush the front of your board with acrylic gel medium. I thinned it with a little water. You could use Mod Podge instead. Center the sticky side of the board over the back side of your paper and press it down. Flip the whole thing right side up and smooth out any bubbles with your fingers. 5. Turn it face down again and trim off the excess paper with an X-acto knife. 6. Apply more coats of gel medium over the entire surface of your board, letting each one dry before adding the next. I did three. These guys are waiting for something to happen to them. 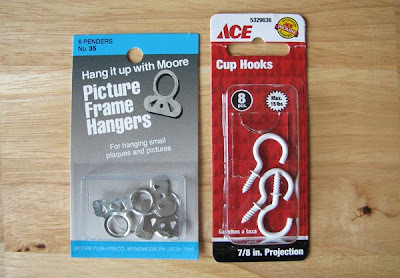 Hooks? Presents for people to hang as little pictures in a nursery? Hmm. Yet to be determined. You have read this article design work / tutorials with the title May 2009. You can bookmark this page URL http://jenkrebs.blogspot.com/2009/05/diy-key-holder.html. Thanks!